Fire crews are battling a blaze burning in the hills above Woodside Tuesday morning, according to Cal Fire. Bob Redell reports. Fire crews are battling a blaze burning in the hills above Woodside Tuesday morning, according to Cal Fire. 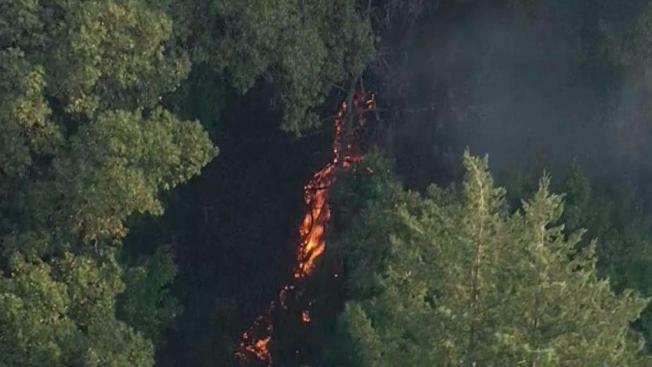 The fire is burning in steep and remote terrain between Interstate 280 and Highway 35, according to Cal Fire. It has scorched roughly 30 acres as of 11 a.m. Tuesday, and firefighters have not reached any containment level. No homes are threatened by the blaze, according to Cal Fire. Still, Bill Hopper, who has been living in the area for 67 years, is keeping a close eye on its progress. "It's pretty scary," he said. "I've been up here all my life. That's the first actual real forest fire that I've seen here in all that time." Access to the fire is difficult because the flames are more than one mile away from the nearest road, according to Cal Fire. About 100 firefighters are battling the blaze on the ground and through the air. Lightning strikes across the region on Monday and early Tuesday are believed to have sparked seven fires in Santa Cruz and San Mateo Counties, according to Cal Fire. Four of those blazes have since been contained. "It was rocking and rolling up here last night," Hopper said.